Start your cooking class with a pickup from the meeting point, and then travel to a family-run, traditional Greek tavern for your 5-hour cooking class. Aprons and cooking utensils are provided, so all thats required is an interest in Greek food on the island of Crete! Then, don your apron, roll up your sleeves and start learning all about classic Greek dishes from your private host. While many countries in the Mediterranean region take pride in their cuisine, Greece is passionate about it, and recipes are often handed down from generation to generation. Toward the end of your session, sit down with your host and group to eat your creations! Dishes are paired with local wine, and you can also enjoy some home-baked bread, too. 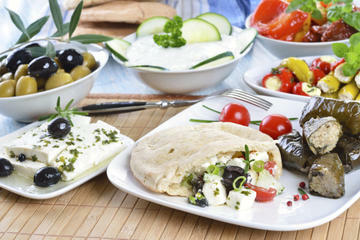 As you eat, chat about the Mediterranean diet, hearing about its health benefits and links to longevity. Before leaving, your host will give you a recipe card so you can recreate the food at home to impress family and friends! Finish your tour with a drop-off at the original departure point.